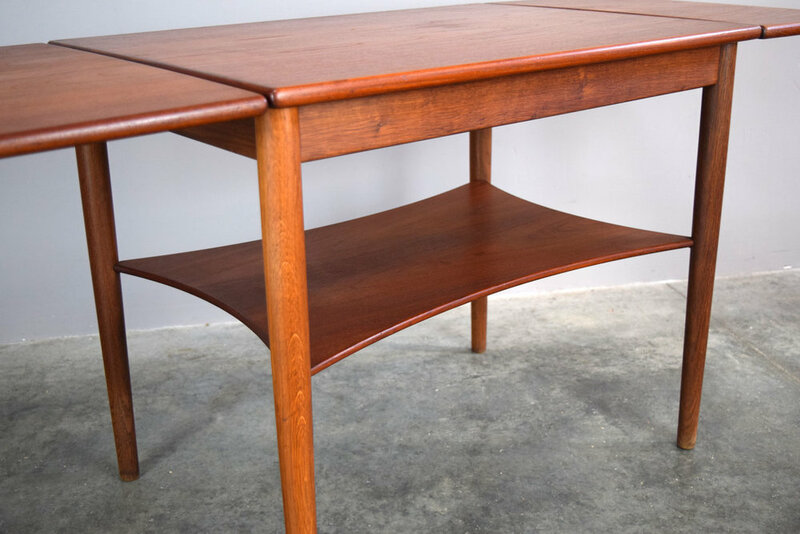 This is a great Danish Modern style table with a hidden, self-storing butterfly leaf. This design was made in the 1960s in the UK by the Danish-designed G-Plan line, however this appears to be a later production. We know that G-Plan continued making furniture into the 1990s, but have no confirmation who made this, as it is unsigned. It’s well-made, though, with wood slides and brass pins. A mystery!! 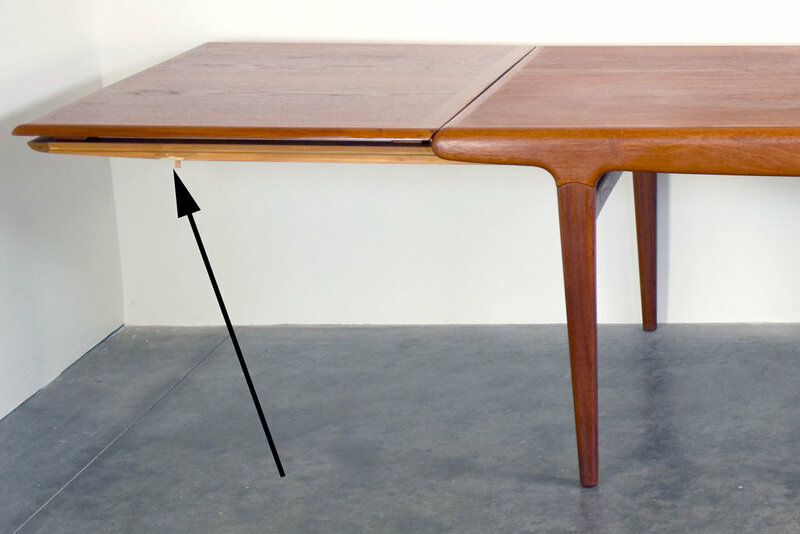 Since we know nothing about its age or materials, we have priced it far below our normal vintage teak tables. 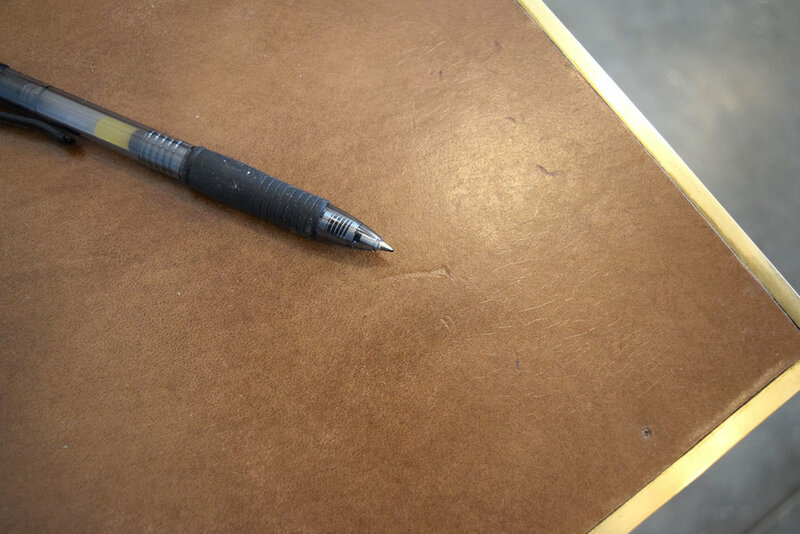 It is in excellent vintage condition with a few scratches and scuffs as shown. 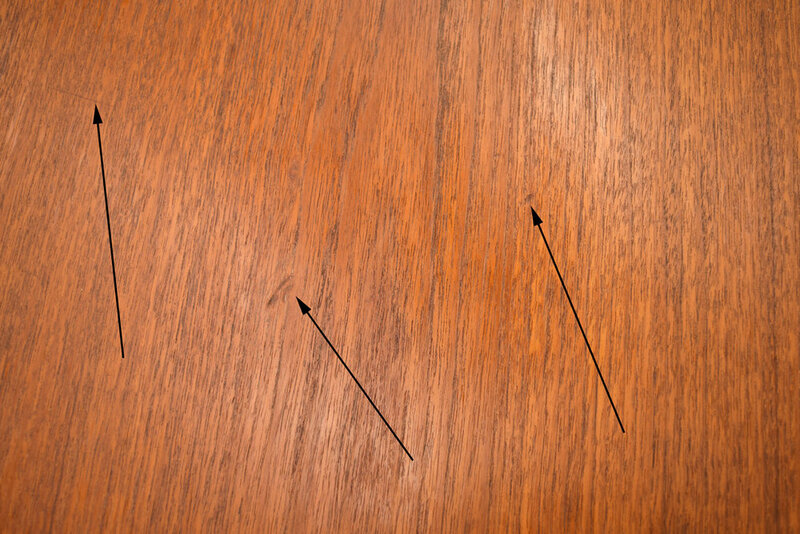 Two of the small internal wooden guides are cracked but still functional. 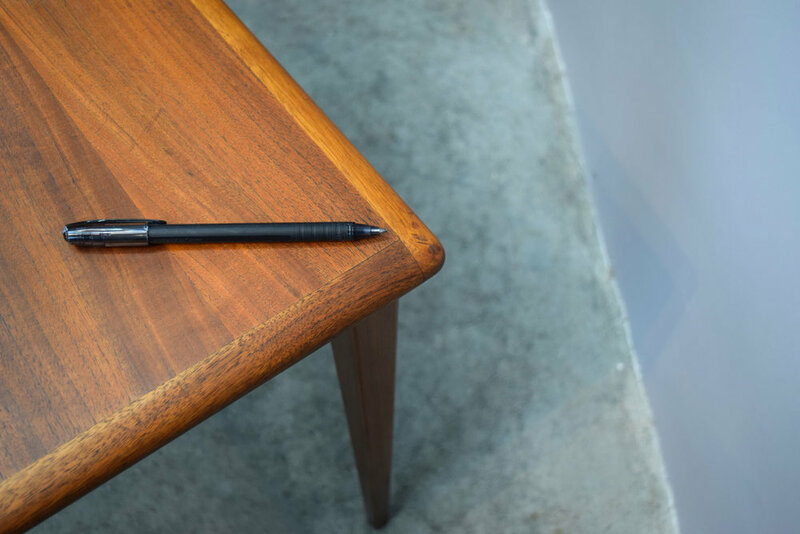 We love the simple, elegant details on this little table. Model VM253, designed by Kai Kristiansen and produced by Vilbjerg Møbelfabrik in Denmark in the 1960s. This table was available as a nest of three in several differen wood species. This one is crafted in beautifully patina’d warm teak. Excellent vintage condition with a few very light scratches on the top. 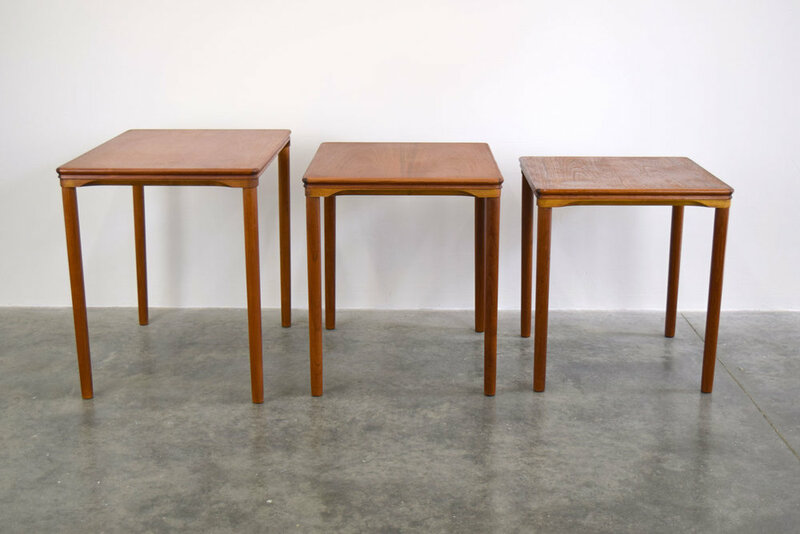 A 1960s set of nesting tables designed by E.W. Bach for Møbelfabrikken Toften in Denmark. We have priced this is a set of two; the smallest table is flawed and we have included it for free. Marked with faded stamp on verso. 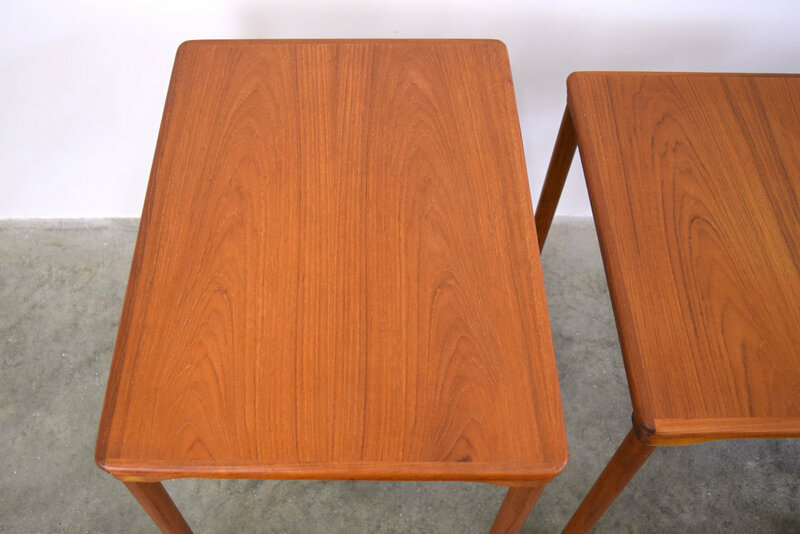 The two largest tables are in excellent vintage condition. The largest has only very tiny scratches. The middle table has a slightly lighter spot in the middle. 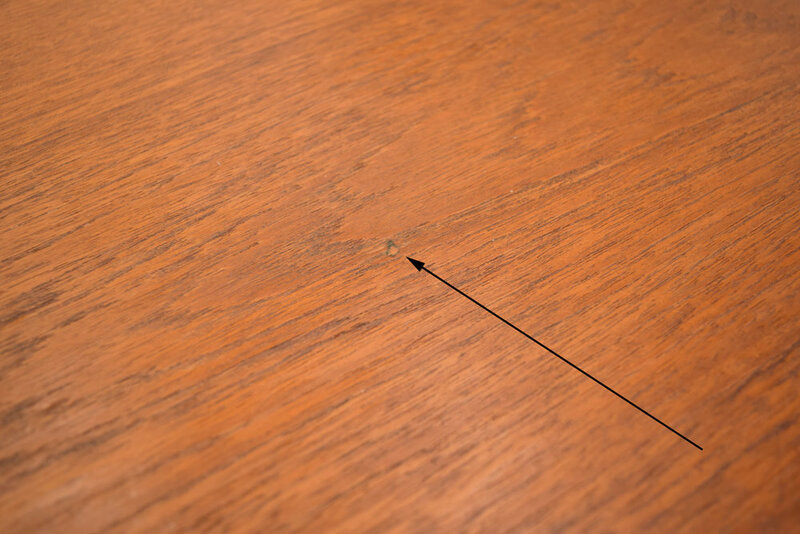 The smallest has an area where the veneer was sanded through by a prior owner, some edge dings, and one end of the frame has a small crack. 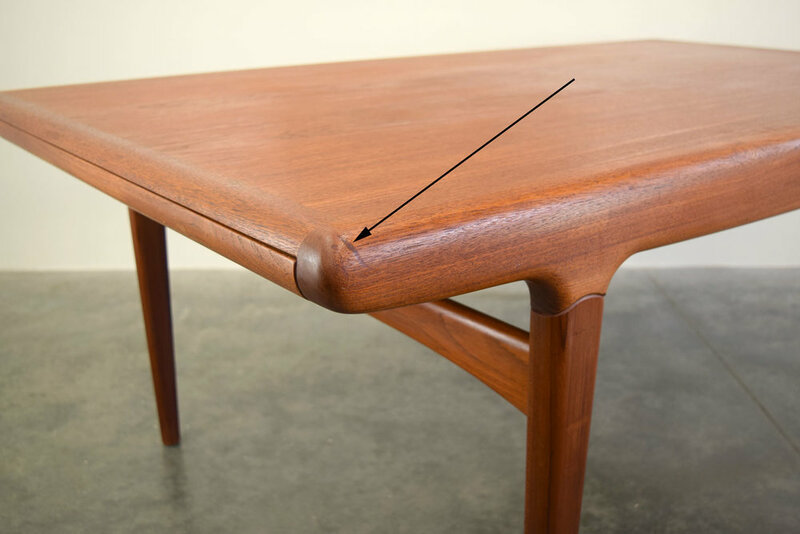 A finely crafted occasional table by American master Paul McCobb’s Directional Series made by Calvin Furniture, Grand Rapids, MI in the 1950s. 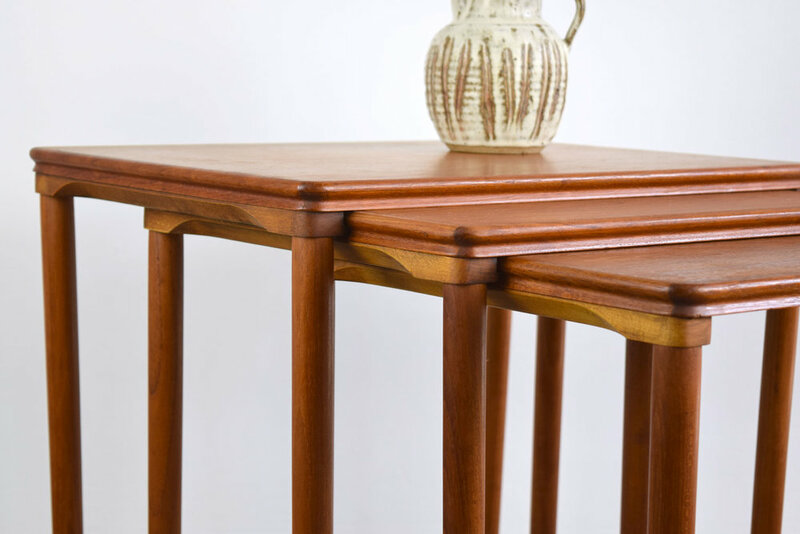 This handsome walnut-framed table has a caned shelf and a leather top with brass edging. This piece is in excellent vintage condition. The leather top has some light wear. This is a highly collectible piece that will certainly increase in value in the years to come. This is a lovely, rare expandable side table with drop leaves by Børge Mogensen for Søborg Mobelfabrik, Denmark. Designed in the 1950s. Very high-quality construction. 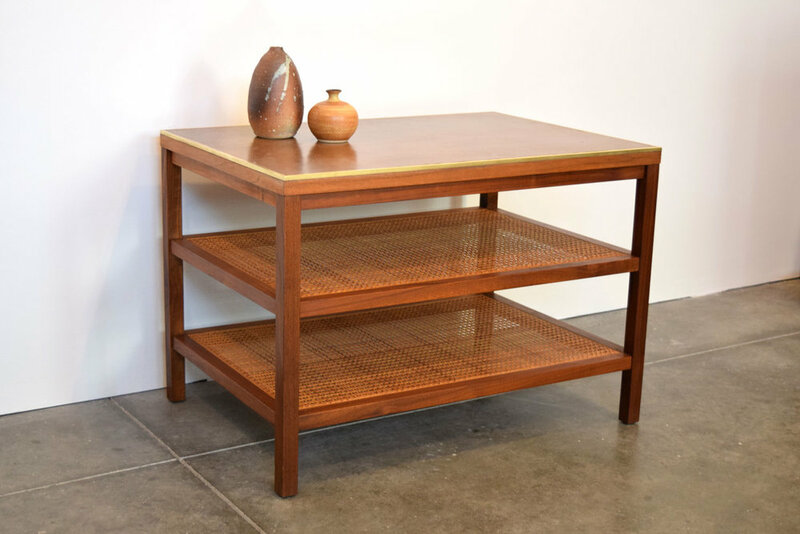 It features removable leaves on brass hardware, typical Mogensen white oak legs, and a sculptural lower shelf; the high-quality teak has a wonderful, warm patina. This piece is in excellent vintage condition with some minor scratches and bruises and a slightly darker spot on the top as shown. 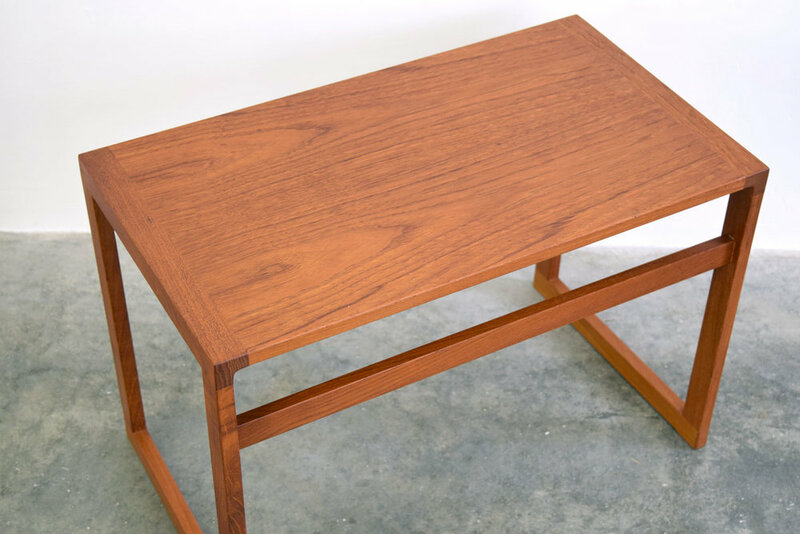 For such a seemingly simple table, this piece has a great presence, with elegant tapered legs and gorgeous walnut grain. So handsome! In very good vintage condition. There are a few scratches and nicks as shown, and one very light ring that could not be caught on film. Nicely proportioned walnut square coffee, cocktail, side- or end-table with a gorgeous oiled finish made in the 1960s. 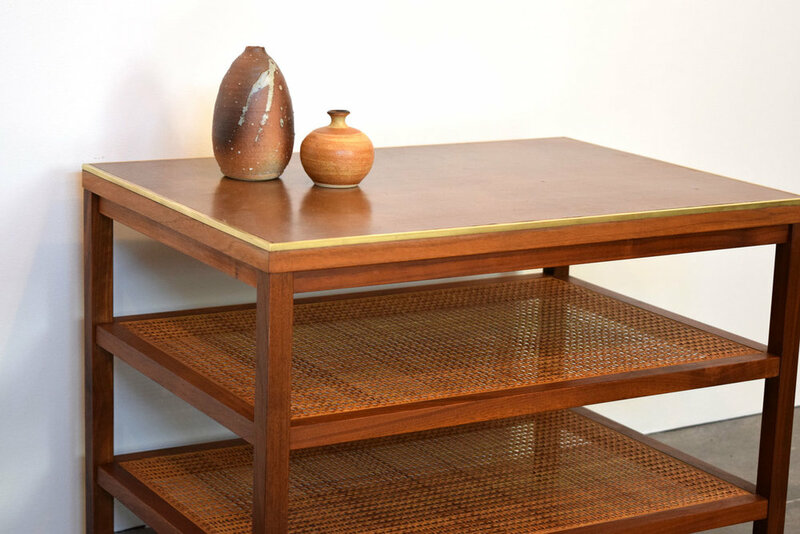 Although unmarked, this table came from an estate filled with Milo Baughman, Thayer Coggin, Eames, and Kipp Stewart among other high-end designer pieces. The owner had purchased everything from fine furniture stores in Manhattan in the 1960s when he worked there in advertising. This sweet table measures 30" x 30" x 19.5" high. It has beautiful, lively walnut grain and is in excellent vintage condition with only very mild signs of wear. There is an area of slight discoloration on one corner as can be seen in the first photo. 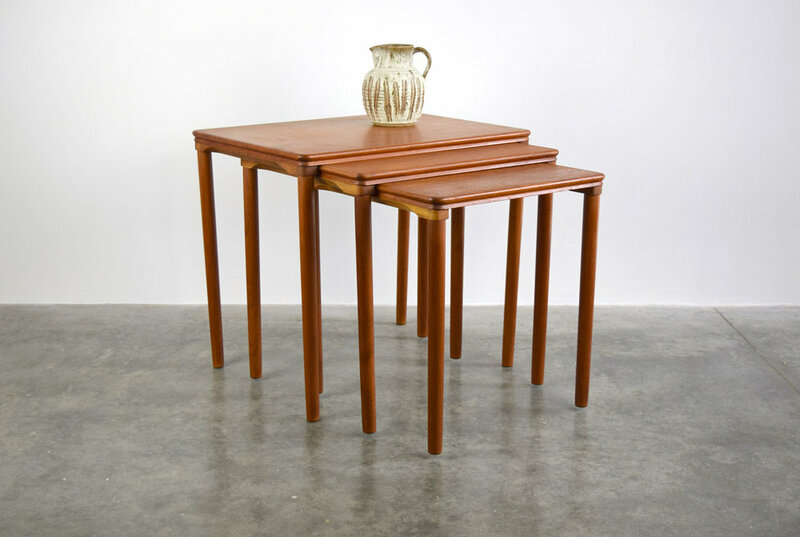 A really cool and unusual side table produced by Dux of Sweden with a removable and reversible solid teak bowl/tray top and beautiful solid teak flared legs. 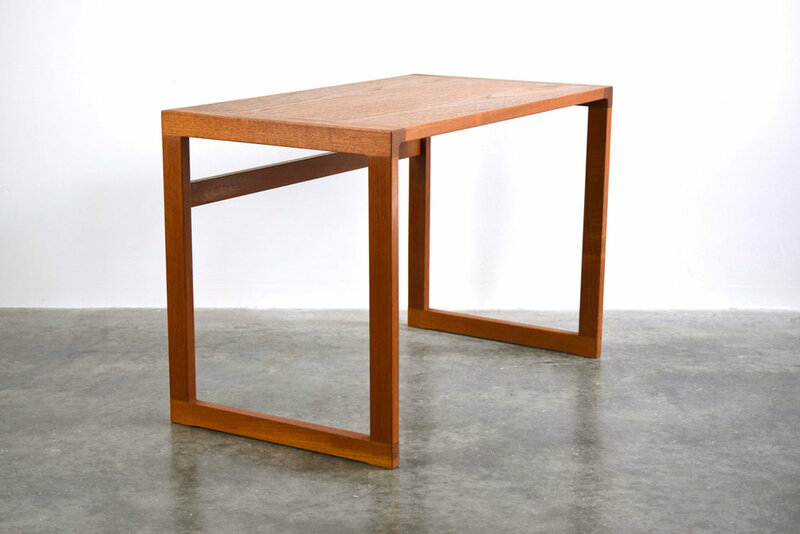 A pair of these tables recently brought a $4000 at Wright auction house in Chicago, so this is a great opportunity to own this excellent piece! Designed by Jens Quistgaard (of Dansk fame) and produced in Sweden first by Kallemo and later by Dux. In very good vintage condition. 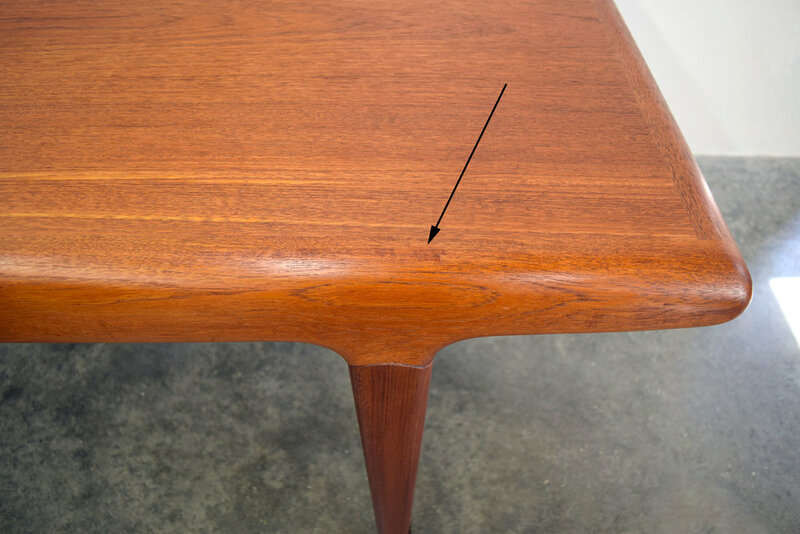 We did NOT sand this piece -since many people prefer the history of small imperfections- but since it is made of solid teak it would be very easy to sand and return to pristine condition. There is a ring on the bottom of the tray top and very light staining on the concave side. See photos. Tray top measures 19.75" diameter.